I’d never refer to “My Favorite ” anything unless it’s the truth (although you’d never hear me tell anyone about My Favorite Child or My Favorite Friend, even if it were the truth). But this is truly my favorite turkey burger recipe. 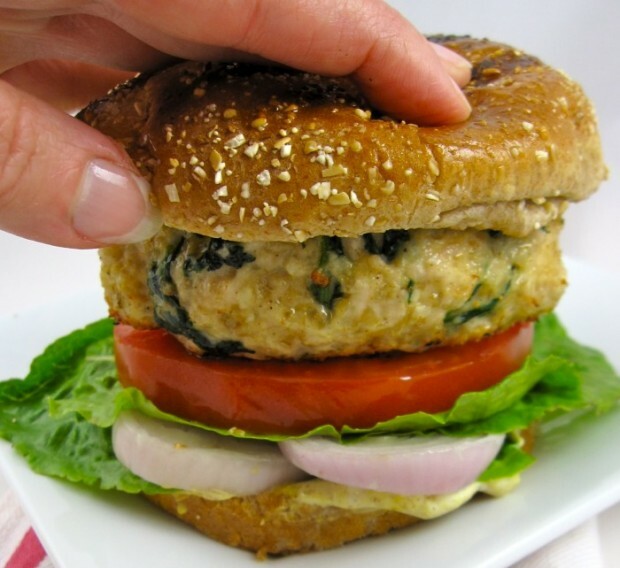 I have another great turkey burger recipe that incorporates olives, sun-dried tomatoes and fresh mozzarella into the grinds, but this burger wins for most healthful — it incorporates grains and greens into the grinds and holds its shape. I went into great detail extolling the virtues of this burger, blogging about it last year. Today’s recipe is the same, but I used a different bun. I couldn’t resist. It was a Paesano-style bun that was still warm in the case at Hiller’s. The burgers come together quickly, despite the long list of ingredients, many of which are optional. The bread was delicious but perhaps too hefty for a burger. My husband thinks stuffing the burger into a pita pocket or serving it all alone would be another great option. This recipe is adapted from Mark Bittman’s Meat-and-Grain Burgers recipe found in the June 2010 issue of Runner’s World magazine. Boil a large pot of salted water. Put spinach in boiling water for 30 seconds; drain in a colander, rinsing under ice cold water. With your hands or clean towels, squeeze spinach dry, then chop. Place spinach in a bowl. Add ground turkey, garlic, 1 teaspoon cumin, pinch of cayenne, 1 teaspoon salt, egg and soaked cracked wheat. Thoroughly combine, then fry or microwave a bit of meat and add additional cumin, cayenne and salt to taste. Preheat gas or charcoal grill to medium heat**. Oil grill grates. Shape ground turkey mixture into 4-6 burgers. Place burgers on grill grates and cover. For thinner burgers, grill 4-6 minutes per side. For thicker burgers, grill 10-12 minutes per side or until cooked to 170 degrees. Lightly toast buns on grill, if desired. Spread condiments on cut side of buns, then layer buns with lettuce, tomatoes and onion, if using, and burger. *Place 1/2 cup dry cracked wheat in a pan; cover with 1 cup boiling water. Cover and let sit for 30 minutes, stirring once. **Bake burgers on a greased baking sheet in a 400-degree oven, 20-40 minutes, instead of grilling, if desired.